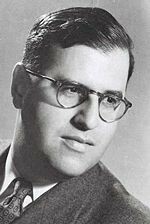 Abba Eban, Israeli diplomat, in 1951. Well, Mr. Wallace, the last ten years have not only been years of violence. They have been incomparable years of joyous creation, of sovereignty restored, of the people gathered in, of a land revived, of democracy established, but there has also been violence imposed by the hostility of our neighbors. For our second decade, we devoutly hope for a period of peaceful consolidation. We hope that there will be no recurrence of the violent conflicts which marked our first decade, but that we and our kindred neighboring people will devote all our efforts to the development of our respective countries and of our common region.